Years ago I did a simple MAME starter guide which 1) wasn’t all that useful 2) is now terribly outdated. Thus, this update, now with pictures! This only covers getting MAME running on Windows. Please leave any feedback or request for clarifications in the comments. Grab the latest stable release from the official MAME site. At the time of writing, it is MAME 0.147. Click on the big shiny button. Most of the time you’ll want the 64 bit binaries if you are running a 64 bit version of Windows. If unsure, grab the i686 binaries. The i686 label should apply to any CPU released after the Pentium II. One should never require the debug binaries. These are all self-extracting archives, so place the file you’ve downloaded into a directory where you want MAME to go the double click on it. After it’s done extracting, you can delete the file you’ve just downloaded. Next, you’ll need some ROMs. Note that there are a few ROMs which have been released for free, non-commercial use. These are available on the MAME website. Look for the ROMs link in the navigation bar. Pick any one to test. It should go into the roms folder. Move the Zip file you’ve downloaded into it. There’s no need to extract the Zip file. Now execute mame64.exe. You should see the game you’ve downloaded listed. Just highlight the game and press enter and the game should start..
To obtain more, Pleas­ure­dome is the best way if you can work Bit­Tor­rent. The total size of the ROMs stand at almost 1630 gigs cur­rently, and so might take a while. The MAME ROM tor­rents are ratio-free but please do not abuse the ratio. Some games require CHDs which are com­pressed hard drive images, but these are gen­er­ally not worth it as most PCs are too slow to emu­late these games properly (modern PCs can easily handle these games). Or if you prefer, you can request for one of the Laz­arus guys to burn you a copy. Read the instruc­tions care­fully, and note that I have never used their services. Note, of course, that it is illegal to download and use ROMs in most cases, so it’s all at your own risk. Note also that MAME updates ROM definitions as better dumps become available so some older copies of ROMs may not work. After more than a decade of development, the best Playstation 2 emulator PCSX2 is finally at the level where the team deems it stable and fast enough to release version 1.0. Check out the screenshots and videos, especially Ōkami in full HD. Beautiful. I’ve never been much of a console gamer, but classic PS2 games in full HD on my PC? Tempting. MAME, for the uninitiated, is the Multiple Arcade Machine Emulator, a project to preserve the inner workings of arcade machines of the past. A curious side-effect is that the games are (mostly) playable. I’ve been a fan since the late 90s and have almost continuously kept my ROM collection up to date, recently with the help of Pleasuredome, but I’ve not actually been playing any games in a long while, neither have I been keeping up with new developments. Recently though, I find myself tired of HD gaming (I’ll get back to you Skyrim, when the DLC is here) and found myself wanting to get some MAMEing done, so I went to grab my old go-to MAME variant MAME32 (been using the official builds in conjunction with clrmamepro) and… turns out it has been renamed MAMEUI, and that it has been EOLed. It still works, but with the explosion of the number of games by MAME supported the ancient controls it uses just cannot cut it anymore. UI refresh is annoyingly slow. Despite working with and liking the command line for most other things, I just don’t like using MAME from the command line. So, the search for a front end goes on. IV/Play is a minimalist front end commissioned by John Hardy IV (long associated with MAME32/MAMEUI) and it is not quite what I’m looking for. A tad too minimalist, maybe. Next I found QMC2, successor to the venerable QMamecat. QT4, so it’s cross-platform. It also supports MAME, MESS and UME*. Plus, it looks like the old MAME32 which I’m immediately comfortable with. Great. 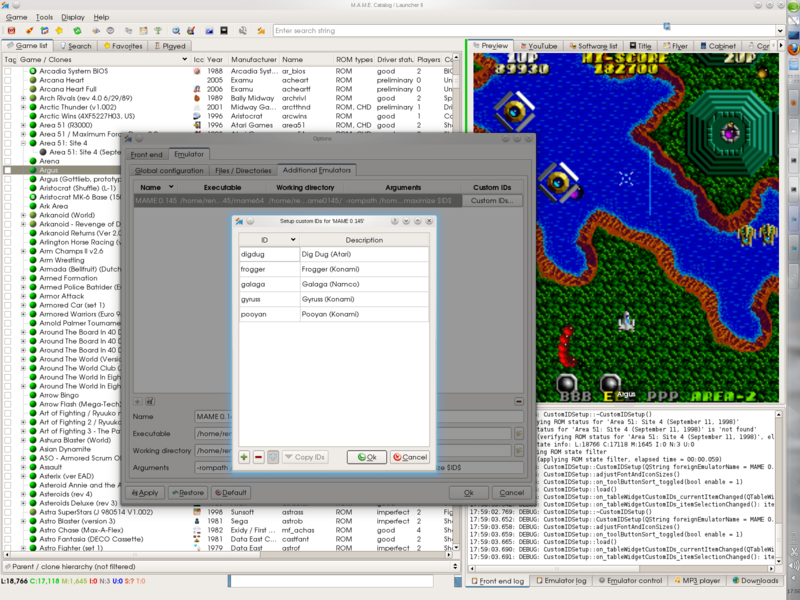 I also found Emu Loader which looks fantastic, plus it supports multiple emulators (Demul, Daphne, ZiNc etc, apart from MAME). Together with its sister app EmuCon which handles console emulators, you’ll just need two front ends to rule them all. I’m leaning a little towards QMC2 at the moment, since I really only dabble with other emulators, but both should be great choices. * UME is an effort by David Haywood (maintainer of MAME from 2003 to 2005) to combine the code bases of MAME and MESS, without stripping any functionality out. Note (Jan 2011): this guide is pretty much outdated. I might write an update soon. What is MAME? 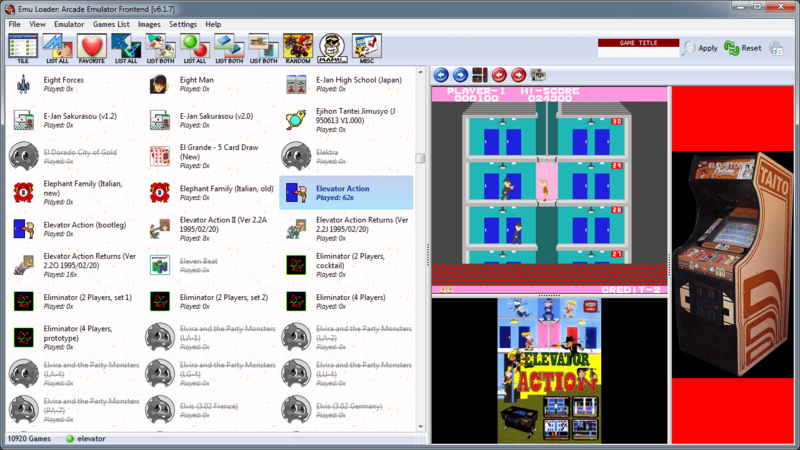 It is an emulator intended to document the hardware of arcade games systems. Of course, for most average users it is the side-effect of being able to play more than 3000 unique games that’s the important thing. Well, that’s all well and good, you say, but how do I start? I’m glad you asked. First, you will need to download MAME itself. If you run Windows, you can download the official release which is run off the command line, but I would recommend Mame32, which has a really nice GUI. For Mac OS X folks it’ll have to be MAME OS X (not very imaginative, yes) or SDLMAME, which is also the best option for Unix/Linux systems. Next, you will need the ROM images*. You can download some freely available ROMs to test. Place the downloaded ROM files into the roms folder where you unzipped MAME to. To obtain more, Pleasuredome is the best way if you can work BitTorrent. The total size of the ROMs stand at almost 16 gigs currently, and so might take a while. The MAME ROM torrents are ratio-free but please do not abuse the ratio. Some games require CHDs which are compressed hard drive images, but these are generally not worth it as most PCs are too slow to emulate these games properly. Or if you prefer, you can request for one of the Lazarus guys to burn you a copy. Read the instructions carefully, and note that I have never used their services. That’s really all you need to start playing. You will probably want to grab the “Extras” torrent from Pleasuredome too. Lots of niceties such as screen captures and photos of the cabinets. * downloading of ROMs is illegal in most cases. You are downloading at your own risk.